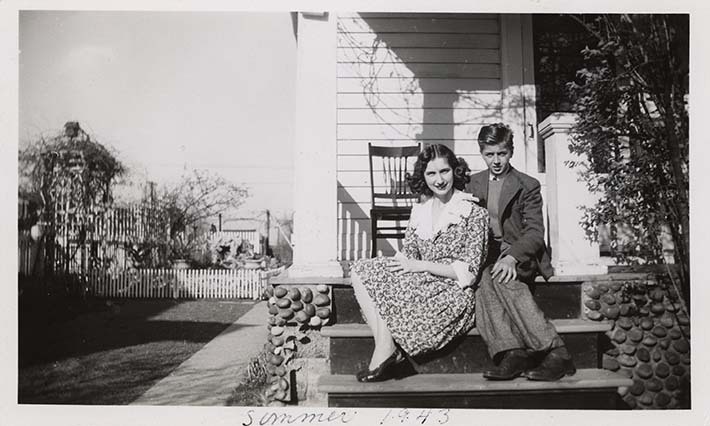 Photograph of Ada & Douglas Brombal, Windsor, ON, summer 1943. Pictured are the Brombal siblings, Ada and Douglas, children of Nereo Brombal, who immigrated to Canada from Italy ca. 1914, and his German-born wife. The family settled in Windsor, ON. In 1940, Brombal was fired from the Windsor Police Department due to his Italian birth. His son Douglas remembers a few tense years during the war, given his mixed German/Italian family. Brombal would never return to his position as a police officer. However, in December 1990, the Windsor Police Commission apologized to Brombal's family. They also created Camp Brombal, for underpriviliged kids, and run by volunteers from the police department, in Nereo Brombal's honour.